Want to know more about Tracing Amy? My Black History is Bessie Stokes Sterling. She is the matriarch of my creativity. © 2018 Amy L. Cole and Tracing Amy: My Ancestral Journey. All rights reserved. My Black History is the ancestors who wouldn’t be considered extraordinary beings. They are extraordinary to me because they survived slavery so that I would come to be. I have spent the last month going through five roles of microfilm that I have rented from the Family History Library trying to find any of my relatives that were married between 1865 – 1909 in Clarke County, MS. The records were segregated at that time, so I was specifically looking at the microfilm of the books labeled “Freedman Marriage Record, Colored”. Since I am focused on the STOKES line, I did find the marriage records for almost all of Grandpa Henry’s children and also the marriage records for several of Grandpa Henry’s siblings. But I could not find his marriage record nor could I find the marriage record for his father, Taylor STOKES. Although I could not find his marriage record, while going through page by page on several of the rolls, I began to notice that a lot of the records were recorded in the book from little slips of paper. Most looked like a note from the person who performed the ceremony or either the nearby merchant asking the clerk to send back the marriage license. Most of the notes had the date, the names of those being married and the assurance that they were both of the appropriate age. Seeing this helped answer a question I have had since 2012 when I found the marriage record for Grandpa John STERLING to Grandma Bessie STOKES. The record had the ages 21 and 18 respectively. I incorrectly assumed that the clerk was listing their ages and thought that my great grandparents had fudged the truth since they would have been older at the time. After seeing those notes, I realize that the law at that time may have been that the male must be at least 21 years old and the female 18 years old in order to marry without parental consent (I have yet to find it). Since the notes didn’t have their actual ages, I don’t know how the clerk could really confirm that they were of age. Having to go through the microfilm because I didn’t find what I was looking for in the index has definitely helped me understand the records a bit better. I now understand how most of them were recorded and the what information I can possibly use from them in my research. Still bombed that I haven’t found Grandpa Henry’s record. The search continues! 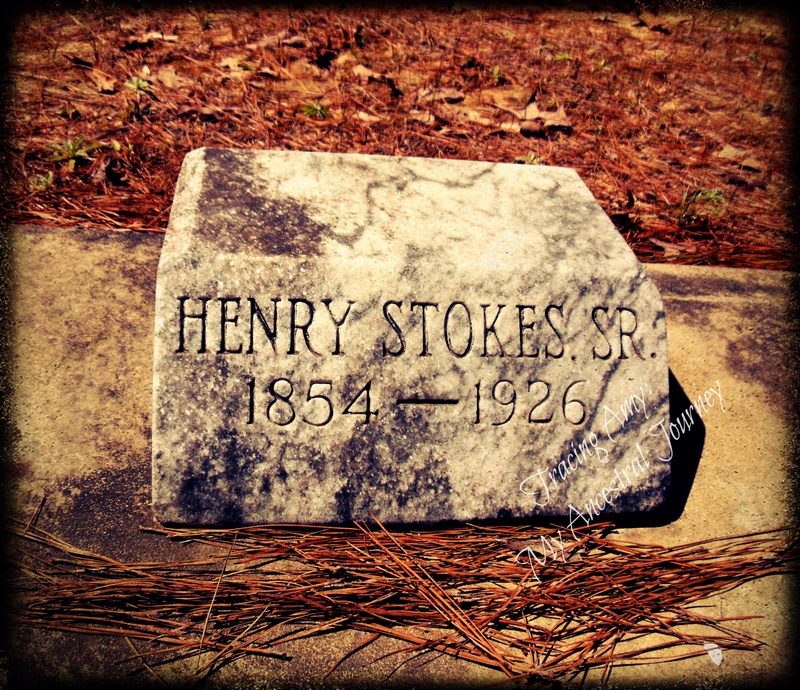 I have been doing a lot of research on the STOKES line of my tree and have been concentrating on the family of Henry STOKES, my maternal great great grandfather. He is the father of Bessie STOKES, whom I shared with you last week. He has been a bit elusive on the census and is making it hard to answer several questions that I have. Out of frustration, I often find myself saying “Grandpa Henry, where are you and why are you hiding from the census taker! !” I have gone page by page, viewed census on ancestry.com, Family Search, and Heritage Quest, and have searched by other family members (siblings, children, wife, etc) as well as neighbors. I even went to the archives to see if he showed up on the soundex index for 1900 and 1920 and came up empty handed. So, either he was hiding or the census taker simply refused to take down the information because I seem to find everyone but him (except for his brother Robert…I can’t find him on 1900 or 1920 either)!! I am not quite sure of his year or place of birth. I am finding conflicts between the census records that I have found, his grave marker, and what is on his and his children’s death certificates (those that I was able to order). I do know that he died on 22 September 1926 in Clarke County, MS1. I was able to find the certificate because the year of his death on his grave marker, so that was easy! When I received his death certificate last year, I learned that his parents’ names were Taylor & Cornelia (?) STOKES2. I was later able to confirm this based on the information received from the STOKES family reunion committee. He married Malissa PICKETT somewhere between 1873 and 1875. I have not been able to find their marriage record in Clarke County. I am in the process of going image by image on the microfilm a second time to be sure it’s not there before I start to look at surrounding counties. From this union I believe there were at least 9 children. I understand that they may have had 2 more children; however, it’s been difficult to confirm the number of children because the family seems to have been skipped on several of the population census for Clarke County. Currently, I only find Grandpa Henry on the 1870 census with his parents3 and the 1910 census with his wife and 3 of the children, one of which is my great grandmother Bessie STOKES4. It’s on that census that the census taker recorded Malissa had given birth to 13 children, 11 of which were still living. It is my goal to find the names of all of the children. I am almost certain they were in Clarke County at the time of the 1900 census because I found that he acquired land in 18975. However, since I can’t find them on any census outside of the two mentioned, I am going through the tax rolls available online for Clarke County to confirm that he was actually in the county during those time periods. In the meantime, I guess I will need to figure out if there is another way to identify all of the children. Interestingly enough, when reviewing his death certificate, I also learned that he married a second time to a woman named Indianer6. Did his wife Malissa pass away or did they divorce? Each new record find seems to add more questions to my list. At this point, I have quite a few questions that I am trying to find the answer for about Grandpa Henry (and his family). I will continue on in my research on his children and siblings in hopes that it will give me the answers I seek. This is my fourth post as a part of the 52 Ancestors in 52 Weeks challenge, created by Amy Johnson Crow of No Story Too Small. 1. Mississippi State Board of Health, death certificate 17599 (1926), Henry Stokes; Death Certificates and Indexes; Mississippi Department of Archives & History, Jackson. 2. New Hope Cemetery (Clarke County, Mississippi; County Road 691 GPS Coordinates: Latitude: 31.98102, Longitude: -88.67754), Henry Stokes, Sr. marker, photograph taken by Amy L Cole, September 2013. 3. 1870 U.S. census, Clarke County, Mississippi, population schedule, Quitman, p.18, family 95, Henry Stolks; digital image, Ancestry.com (http://www.ancestry.com: accessed 2013); citing Family History Library microfilm: 552225. 4. 1910 U.S. census, Clarke County, Mississippi, population schedule, Quitman, p. 76, dwelling 652, family 652, Henry Stokes; digital image, Ancestry.com (http://www.ancestry.com: 2013); citing Family History Library microfilm: 1374749. 5. Clarke County, Mississippi, U.S. General Land Office Records, 1796-1907, Ancestry.com (http://www.ancestry.com: accessed 27 July 2013), entry for Henry Stokes, T2N, R16E, S27; generically citing United States Bureau of Land Management, General Land Office Records as the source of this database. 6. Mississippi State Board of Health, death certificate 17599 (1926), Henry Stokes. © 2014 Amy L. Cole and Tracing Amy: My Ancestral Journey. All rights reserved. 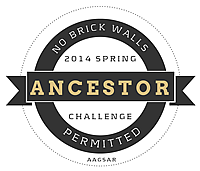 Amy L Cole, “52 Ancestors #4: Finding Henry STOKES,” Tracing Amy: My Ancestral Journey, 16 March 2014 (https://tracingamy.wordpress.com: [access date]). Bessie STOKES, Momma Bessie as she is known to our family, was born to Henry and Malissa (Pickett) STOKES in Clarke County, MS on March 10, 1893.1 Today is the anniversary of her birth 121 years ago. I was able to find Momma Bessie living with her parents on the 1910 census as a teenager.2 When she was 22 years old, she married John “Johnny” Sterling and she began her journey as a wife and mother.3 Together they had 7 children: Lillie (1915 – 2006), Lucille (1916 – 2000), Maudie (1919 – 1990), John (1920 – 2003), Thomas (1922 – 1988), George (1927- 2010), and Orvelle. I never got to meet Momma Bessie, I only know her through the stories told by my mom and her siblings. From their stories, I gathered that they loved spending time with Momma Bessie. My mom said “we would go wherever she would go to get away from the house”. Mom most remembered that she loved to go fishing and visiting people in the neighborhood.6 She was also the favorite aunt of my 95 year old cousin. She says that Aunt Bessie, as she called her, was fun to be with and had something to laugh about all the time.7 I really wish I could have met her. Since I didn’t, I will do my best to preserve the memories of her. This is my third post as a part of the 52 Ancestors in 52 Weeks challenge, created by Amy Johnson Crow of No Story Too Small. 1. Mississippi State Department of Health, delayed birth certificate no. 112100 (1956), Bessie Stokes; Vital Records; Jackson. 2. 1910 U.S. census, Clarke County, Mississippi, population schedule, Quitman, p. 76, dwelling 652, family 652, Henry Stokes, Malisy, and Bessie; digital image, Ancestry.com (http://www.ancestry.com: 2013); citing Family History Library microfilm: 1374749. 3. Clarke County, Mississippi, “Freedmen Marriage Record, Colored; v3 1914 – 1919”, page 39 for John Sterling and Bessie Stokes, Office of the Clerk of Circuit Court, Quitman. 4. 1940 U.S. census, Clarke County, Mississippi, population schedule, Quitman, p.13, family 112, Bessie Sterling; digital image, Ancestry.com (http://www.ancestry.com: accessed 2012); citing National Archives and Records Administration, 1940; Roll T627_2015. 5. Clarke County, Mississippi, Chancery Court, divorce file 3950 (1940), John Sterling v. Bessie B Stokes Sterling, final decree; Office of the Clerk of Chancery Court, Quitman. 6. Jerlean (Edwards) Pruitt, Quitman, MS, interview by Amy Pruitt Cole 05 July 2013; audio privately held by interviewer, Georgia, 2014. 7. Malissa (Rogers) Speed, Quitman, MS, interview by Amy Pruitt Cole 12 March 2013; audio privately held by interviewer, Georgia, 2014. 8. Mississippi State Department of Health, death certificate 13450 (1962), Bessie B. Stokes; Vital Records, Jackson. 9. New Hope Cemetery (Clarke County, Mississippi; County Road 691 GPS Coordinates: Latitude: 31.98102, Longitude: -88.67754), Bessie Sterling marker, photograph taken by Amy L Cole, September 2012. Amy L Cole, “52 Ancestors #3: Bessie STOKES STERLING (1893 – 1962),” Tracing Amy: My Ancestral Journey, 10 March 2014 (https://tracingamy.wordpress.com: [access date]). I have been tracing the genealogy and history of my family since 2012. I am researching both my paternal and maternal lines. © Amy L. Cole and Tracing Amy: My Ancestral Journey 2013 - 2015. Unauthorized use and/or duplication of this material without express and written permission from this blog’s author and/or owner is strictly prohibited. Excerpts and links may be used, provided that full and clear credit is given to Amy L. Cole and Tracing Amy: My Ancestral Journey with appropriate and specific direction to the original content.